Officially licensed NFL team neon sign. Are you all about the Silver and Black? Then you need this Oakland Raiders neon sign for your garage or gameroom to show Raider Pride. 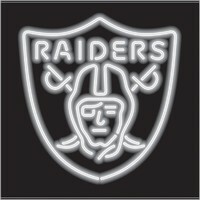 The white glow of the neon logo will show all that Raiders Football is number 1. Solid state transformer backed by full 3-year warranty. Sign is a 100% hand crafted, with quality 1/2" diameter neon glass tube. Mounted on plastic.